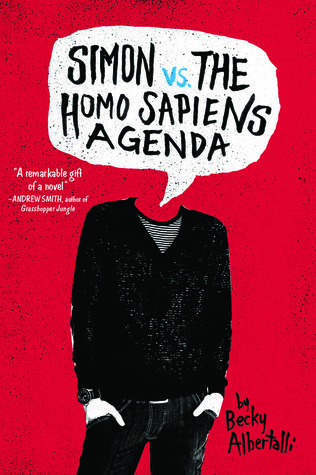 “Simon vs. the Homo Sapiens Agenda” by Becky Albertalli is about sixteen year old Simon and how he is not openly gay. With anyone. He’s been keeping this secret to himself for a while now and hasn’t found the courage (or the point) to tell anyone. But one day when a classmate winds up with screenshots of private emails Simon has with a secret guy code named Blue, things start to get a little more difficult. Now he has to find a way to not jeopardize his friendships, compromise himself, or ruin a shot at happiness with a guy who’s confusing, but oh so adorable. When I first heard of this book I knew I had to get it because it had some great reviews from people I trust who had gotten the ARC copy and loved it. Well, now that I read it I can see why they loved it. I will admit it did take me about fifty or so pages to get used to the writing style, but once I was in it, I was hooked. This book was a great telling of a kid struggling with his sexual orientation – or rather, how to come out about it. It was a much more positive story than a lot of the negative ones that we hear all the time when teens come out to their parents, and I loved that. I loved reading a positive story because I think kids need that; they need positive reinforcement if they are struggling through something as monumental (and let’s be real, it is monumental) thing such as coming out to your family and friends, let alone the world. So let me talk about Simon. He’s a sixteen-going-on-seventeen year old junior in high school. He’s in the school’s fall play and is leading a total normal teenage life: friends, parties, chilling, hanging, family life. One big thing about him, though, is he’s gay. And he has this sort of relationship developing with this guy, Blue (code name), since August of that summer. He swears a lot and is kind of sarcastic at times, but I believe he’s an overall good kid. He makes mistakes (plenty of them), but he’s one of those characters you can’t help but love because of all of those flaws and all of his thoughts and how he acts and stuff. When he has a tough decision to make in terms of blackmail, I can understand the want to ignore it, but also the want to do something about it. I think Simon makes good decisions throughout the novel and he grows as a character. He goes from being so confused and conflicted, to dealing with a lot of crappy, to being pretty damn happy with himself. And his friends and family are no exception. I’m so happy to read of a family that supports Simon when he comes out to them. I thought that those parts of the book were kind of glazed over and really super fast, but the support was there. Often times it’s not. But everyone took it in stride (maybe some part of them knew?). Now Blue is kind of mysterious. He’s extremely shy and doesn’t want to give his identity away at all, no matter what. And he doesn’t want to meet Simon, necessarily, because he’s scared. I get that. A couple of times I was frustrated like, “Just meet the guy! Gosh!” But I understood he wanted privacy for now. He was afraid that once Simon found out who he was that Simon would push him away. But the two would flirt constantly and you could start to really see their flirtations grow and even their love for each other grow. And then when they do meet. COMMENCE THE SQUEAL SESSION. I literally squealed throughout the entire last fourth of the book, and let me tell you, SO. MUCH. CUTE. Okay, now that I got that off my chest. The plot of the book was one that I believe we see many times in contemporary books, but the way the author writes it and spins it is what makes it unique and defining. Obviously the most defining quality of this book is a not-so-openly gay teen. But I think the way that Albertalli wrote about the blackmail and just how everything kind of happened and exploded online and everything was a unique way of doing it. It was like a conscious stream of thought from Simon’s head, so the sentences were often short and straight to the point. Also, I thought it interesting that I had NO CLUE what Simon looked like until the last half of the book where we finally got some descriptions of him. And I think that stuck out to me so much because it hit me that it was so obvious that what he looked like hadn’t been mentioned earlier in the book because it wasn’t relevant – it was Simon’s point of view, so why would he just talk about his appearance for no reason? I loved the mystery surrounding Blue and who he was. I was surprised to find out who it was in the end, and was actually really happy for one major reason (which I won’t state here because it’s an obvious giveaway). I definitely think this was a great read. Not only a successful coming out story, but one with redemption and forgiveness on multiple characters’ parts, as well as friendship and just finding yourself in who you are. I highly recommend this to anyone, really. I rate this book 5/5 stars. This entry was posted in Book Review and tagged 5 stars, becky albertalli, book, coming out, contemporary, gay, read, reading, review, simon vs, simon vs the homo sapiens agenda, teen, ya, young adult. Bookmark the permalink. Oh my god I HAVE to read this! Thank you thank you thank you SO much for reviewing this; it sounds amazing! Oooh, I got spammed! 😀 Don’t worry about it! I put the book on my TBR list.